PRODUCT DESCRIPTION: Clear odorless liquid which is used on surfaces where you don’t want mold/fungus to grow. It is a clear liquid, pretty much odorless though in the container you might be able to detect a slight alcoholic aroma. It dries clear and invisible and can be used on just about anything. WHERE TO USE IT: Mold Block is fine for air filters, air conditioners, recirculating air pumps, bed sheets, blankets and bed spreads, carpets, draperies, upholstery, sleeping bags, natural down, nylon, polyester, rayon, wool, fiberglass, fire hoses, humidifier belts, mattress pads, mens underwear and outer wear, jackets, sweaters, coats, raincoats, ponchos, roofing, tents, tarpaulins, sails, ropes, athletic and casual shoes, shower curtains, bathrooms, kitchens, socks of all kinds, throw rugs, towels, toilet tanks and seat areas, umbrellas, vacuums, wall paper, cars, windows, floors, cement, wood, and basically anywhere on anything other then people or plants. Use it on counter tops, pipes, plumbing, deck umbrellas, awnings, concrete and other surfaces in or on homes where moisture is present and high enough to foster unwanted fungus. 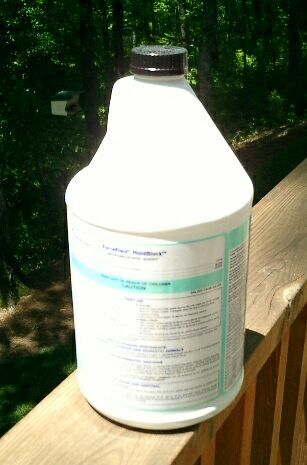 RATE OF APPLICATION: A quart will treat about 50 sq/ft or an area which is 5 feet tall and 10 feet long. Gallons will treat about 200 sq/ft or an area which is 10 feet high and 20 feet long. Applications can last as long as 2 years. However, annual applications are suggested to insure you don’t have any fungus regrowth.